Citation: Wong JP, Walters JR, Cuddalore Arivudainambi V, et al. Refractory Wheezing in Infancy: Congenital Pulmonary Vein Stenosis. J Pedia Health Care Med 2018;1(1):20-21. Congenital Pulmonary Vein Stenosis is a rare condition that presents in infancy with refractory wheezing from pulmonary venous obstruction. It should be considered when more common causes of wheezing have been excluded. Our case, a 6-month-old boy presented with a progressive course. His echocardiogram demonstrated stenosis of the right pulmonary veins which was defined and followed on cardiac computed tomography. LEARNING OBJECTIVES: Refractory wheezing is recurrent or prolonged wheezing that is difficult to treat and unresponsive to therapy. In infancy, this type of wheezing should elicit investigation for less common causes. Due to the close relationship between the circulatory and respiratory systems, cardiac anomalies should be considered. Our case of congenital pulmonary vein stenosis presented with refractory wheezing from pulmonary venous obstruction. Unfortunately, this disorder has an unrelenting course. Even with early diagnosis and current surgical management, the outcome is poor. Wheezing is a high pitched expiratory breath sound. It originates from the narrowing of small bronchial airways or bronchospasm, as commonly seen in asthma or respiratory infections. Less commonly, mucosal swelling, external compression or inhaled foreign body can cause wheezing. However, due to the close relationship between the circulatory and respiratory systems, wheezing may dominate the clinical picture of congenital cardiac abnormalities. Lesions associated with large left-to-right shunts can cause wheezing, such as the ventricular septal defect or atrioventricular septal defect, or from left ventricular failure and pulmonary venous congestion. Infrequently, wheezing may result from external compression of a vascular ring as it encircles the trachea or lesions with massive cardiomegaly from bronchial compression of a large tense pulmonary artery or distended left atrium. Further, pulmonary venous obstruction from anomalous drainage, cor triatriatum or mitral supravalvular ring and valve stenosis are uncommon causes. We describe a case of an infant with refractory wheezing from congenital pulmonary vein stenosis. Although rare, congenital pulmonary vein stenosis causing pulmonary venous obstruction should be considered when more common causes, such as bronchiolitis or foreign body aspiration, have been excluded. A 6-month-old boy presented with recurrent wheezing, shortness of breath and respiratory tract infections. He was first admitted to hospital at 2 months of age after unscheduled office visits for similar symptoms. There was no history of cyanosis, apnoea or foreign body aspiration. Clinical response to salbutamol and fluticasone metred dose inhalers was minimal. The child was a product of natural conception. His mother had well-controlled gestational diabetes. Her integrated prenatal screening and anatomical ultrasound scan were normal. The child was born at 39 weeks gestation. His birth weight was 3.79 kg. His perinatal course was uncomplicated. His family history of atopy, eczema and asthma was negative. On physical examination, his weight was 8.2 kg (25th percentile) and length was 73 cm (85th percentile). His percutaneous oxygen saturation was 99% in room air, capillary refill time was 3 seconds, heart rate was 112 beats/minute and blood pressure was 91/48 mmHg. He was mildly tachypneic (respiratory rate of 45 breaths/minute). His brachial and femoral pulses were palpable. On cardiac auscultation, a soft grade 2/6 systolic murmur was best heard at the mid-left sternal edge. His heart sounds were normal. Expiratory wheezes were heard throughout his chest. Although, greater on the right side. The child’s nasopharyngeal polymerase chain reaction assay for respiratory viruses was negative. His electrocardiogram was normal. His chest radiograph showed interstitial edema predominantly of the right lung and increased vasculature of the left lung. However, pleural effusion was not evident. His echocardiogram demonstrated moderate to severe stenosis of the upper and lower right pulmonary veins (Figure 1). The left pulmonary veins were unobstructed. There was good biventricular function and no evidence of pulmonary hypertension. Cardiac computed tomography (CT) with contrast confirmed focal stenosis of all right pulmonary veins at the connection to the left atrium with redistribution of pulmonary blood flow to the left lung (Figure 2). 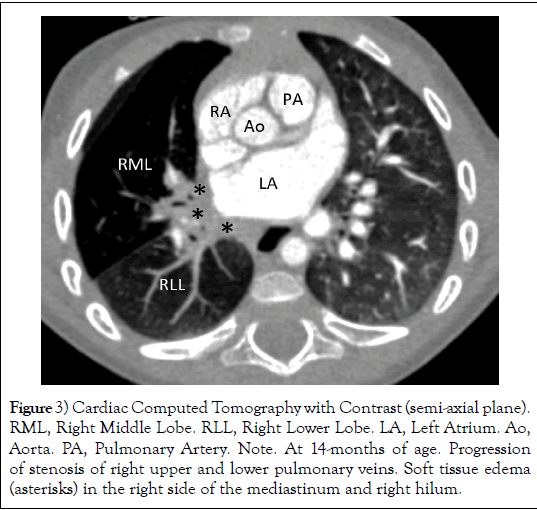 Eight months after presentation, cardiac CT revealed progression of stenosis of right upper and lower pulmonary veins (Figure 3) and emphysema of the right middle lobe with long segment narrowing of the right lobar bronchus. After careful consideration, the cardio-surgical team and family chose not to intervene due to the poor results of pulmonary vein stenting and surgery. Currently, the child has no clinical evidence of pulmonary hypertension. 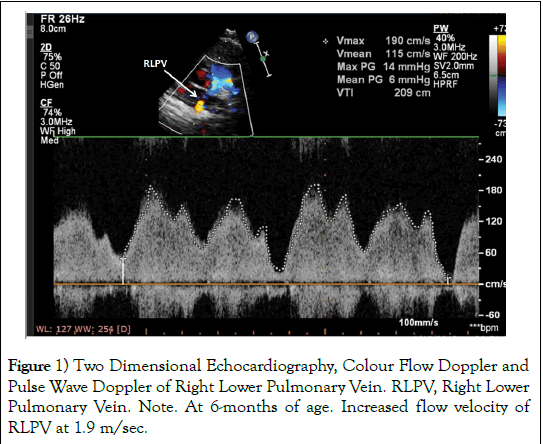 Figure 1 Two Dimensional Echocardiography, Colour Flow Doppler and Pulse Wave Doppler of Right Lower Pulmonary Vein. RLPV, Right Lower Pulmonary Vein. Note. At 6-months of age. Increased flow velocity of RLPV at 1.9 m/sec. Figure 2 Cardiac Computed Tomography with Contrast (semi-axial plane). RUPV, Right Upper Pulmonary Vein. RLPV, Right Lower Pulmonary Vein. LUPV, Left Upper Pulmonary Vein. LLPV, Left Lower Pulmonary Vein. LA, Left Atrium. Ao, Aorta. PA, Pulmonary Artery. Note. At 9-months of age. 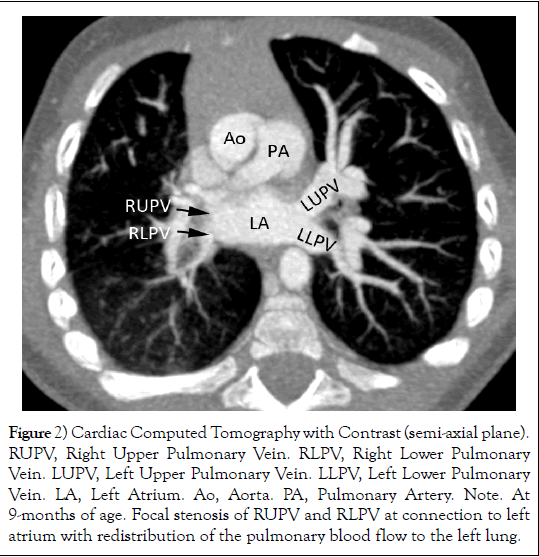 Focal stenosis of RUPV and RLPV at connection to left atrium with redistribution of the pulmonary blood flow to the left lung. Figure 3 Cardiac Computed Tomography with Contrast (semi-axial plane). RML, Right Middle Lobe. RLL, Right Lower Lobe. LA, Left Atrium. Ao, Aorta. PA, Pulmonary Artery. Note. At 14-months of age. Progression of stenosis of right upper and lower pulmonary veins. Soft tissue edema (asterisks) in the right side of the mediastinum and right hilum. Congenital pulmonary vein stenosis is a rare condition. It has been postulated to be an abnormal embryological connection in cardiac development of the common pulmonary vein to left atrium . Half of patients may have associated cardiac anomalies, including all major malformations. Stenosis may appear as a discrete shelf or diffuse hypoplasia. The latter may not be evident at birth which suggests a pathologic process of cell proliferation and deposition of extracellular matrix [1-3]. The severity, number and sidedness of obstructed pulmonary veins dictate the patient’s symptoms. Left sided involvement is worse than right. Most patients present within the first months to years of life with recurrent tachypnea, wheezing and pneumonia. Progressive stenosis results in pulmonary hypertension and edema. Hemoptysis may be prominent. In young children, echocardiography can provide visualization of the pulmonary veins. Turbulent flow on colour flow doppler or monophasic and increased pulse flow velocity indicate significant obstruction. The pulmonary veins should be thoroughly assessed in all children with congenital heart disease and unexplained pulmonary hypertension. Magnetic resonance imaging and cardiac CT with contrast are useful noninvasive diagnostic techniques. Cardiac angiography provides detailed fluoroscopic visualization of the pulmonary veins while radionuclide quantitative pulmonary flow imaging best evaluates flow distribution . The outcome of congenital pulmonary vein stenosis is guarded. Involvement of all pulmonary veins usually indicates a progressive course with poor long-term survival complicated by pulmonary hypertension, intercurrent respiratory infection or hemoptysis . Patients with few pulmonary veins involved have a less severe course. The outcome of surgical repair or stenting remains uniformly poor [6-7]. Lung transplantation may be a therapeutic consideration in unrelenting and treatment refractive progression to severe pulmonary hypertension and secondary right heart failure. The authors thank the patient’s family for allowing them to share this case and Drs. SJ. Yoo, J. Coles and M. Abdurrahman for assistance and review of the manuscript. There are no financial relationships relevant to this article to disclose from all the identified authors. There are no conflicts of interest to disclose from all authors. Latson LA, Prieto LR. Congenital and acquired pulmonary vein stenosis. Circulation. 2007;115:103-108. Sadr IM, Tan PE, Kieran MW, et al. Mechanism of pulmonary vein stenosis in infants with normally connected veins. Am J Cardiol. 2000;86:577-579. Kato H, Fu YY, Zhu J, et al. Pulmonary vein stenosis and the pathophysiology of “upstream” pulmonary veins. J Thorac Cardiovasc Surg. 2014;148:245-253. Drubach LA, Jenkins KJ, Stamoulis C, et al. Evaluation of primary pulmonary vein stenosis in children: Comparison of radionuclide perfusion lung scan and angiography. Am J Roentgenol 2015;205:873-877. Charlagorla P, Becerra D, Patel PM, et al. Congenital pulmonary vein stenosis: encouraging mid-term outcome. Pediatr Cardiol 2016;37:125-130. Quinonez LG, Gauvreau K, Borisuk M, et al. Outcomes of surgery for young children with multivessel pulmonary vein stenosis. J Thorac Cardiovasc Surg 2015;150:911-917. Lo Rito M, Gazzaz T, Wilder TJ, et al. Pulmonary vein stenosis: severity and location predict survival after surgical repair. J Thorac Cardiovasc Surg 2016;151:657-66.